Imprint Area: Cap Screen 1" x 1/2"; opposite clip. Barrel Laser 1 1/4" x 1/4"; 90 degrees to clip. Cap Laser 1 1/4" x 1/4"; 90 degrees to clip. Sapphire, Emerald, Ruby and Onyx. Screen Imprint: $25 screen charge. 1 color available on the cap. 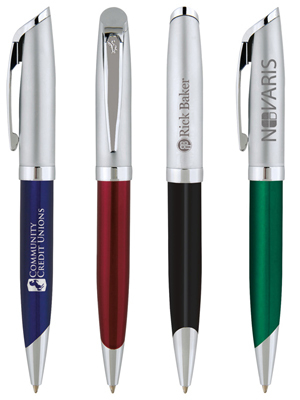 Optional Laser Engraving: $40 laser set-up per location plus $.60 running or personalization charge per pen. The cap engraving includes a gray color fill. Standard 9 lbs. (approx.) @ 100 per carton. Special packaging available, click here. 2-day service at ground rates. BIC Air Express 1 Day Air. Click here for details.